The New York Metropolitan Transportation Authority (MTA) announced substantial completion of two significant contracts on East Side Access, the megaproject that will bring Long Island Rail Road (LIRR) service to Grand Central Terminal. Workers have completed construction of a subterranean ventilation facility below East 55th Street in Manhattan, and $56.2 million in infrastructure improvements to Harold Interlocking, in Sunnyside, Queens, the busiest passenger train junction in the U.S. and the place where the tracks for the connection to Grand Central will meet with the LIRR. 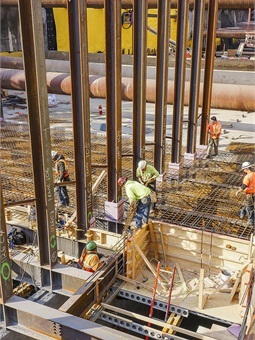 Under the steel deck, workers safely executed 144 controlled blasts that, along with mechanical excavation, removed 10,000 cubic yards of rock and soil — or enough to fill three Olympic-sized swimming pools — to create space that provides a pathway for the air to flow to and from the tunnels below. The facility extends 150 feet below street level, but is entirely hidden from view on the street, with the exception of an emergency hatch and ventilation grates in the sidewalk. To be easier to navigate for those wearing high-heeled shoes, the sidewalk “high-heel friendly” grates are made with slip-resistant surfaces and the openings between the cross-bars are only one-half inch wide. 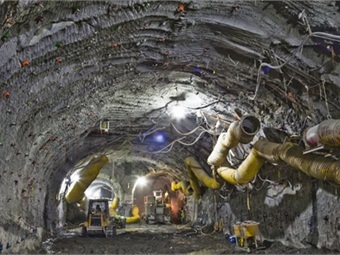 East Side Access is the largest transportation infrastructure construction project in the country. When it opens for passenger service, which the MTA forecasts will take place in 2022, it will serve an expected 162,000 LIRR customers every day at a new station being built under Grand Central. The project will double the LIRR’s capacity to bring trains into Manhattan and allow Metro-North Railroad’s New Haven Line to access Penn Station via four stations that will be built in the Bronx. It is the most transformative project for New York’s railroad network since the Pennsylvania Railroad built a total of six tunnels under the East and Hudson Rivers and inaugurated train service to Pennsylvania Station in 1910.